One again I am doing an X-mas count-down for the miniature enthusiasts, but this year I am kind of well-prepaired. 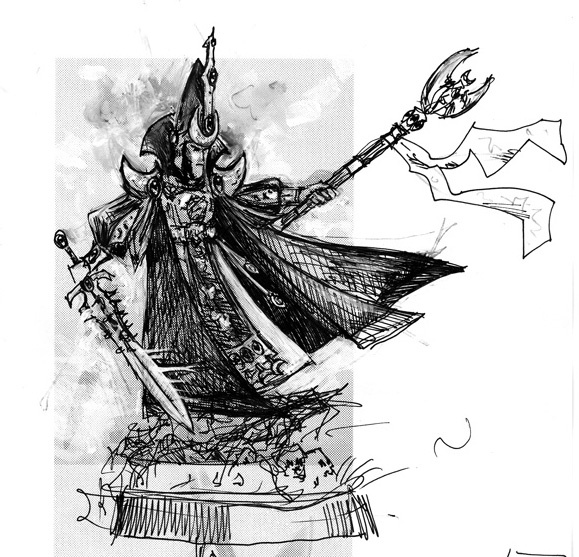 The count-down features the creative process I went through when I created my entry for Golden Demon UK '08, a redesign of High Elf Arch Mage Teclis. My goal was to create a less bulky, more refined, and yet simple model taking inspiration from some of the new HE artwork - both from the army book and from Warhammer Online. Some might have seen the model in the cabinet at the event, other have seen small pics on the web, but by X-mas I will both present the model as it was presented back in september and I will put in the hours of work needed to finish him properly. First picture show my sketch for the project - the inspiration comes mostly from Paul Dainton's artwork, but I also used Jes's old Teclis model from 1993 as well as the HE artwork in "The Gothic and the Eldritch".